Adam Gase and his Miami Dolphins (5-6) have lost six of their past eight games, including two in a row, to fall below .500 for the first time in 2018. 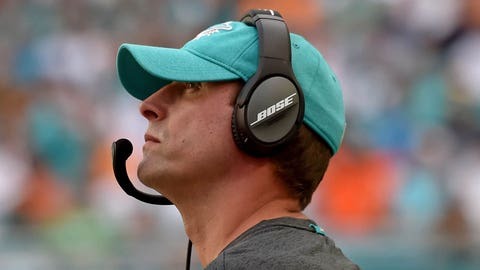 DAVIE, Fla. (AP) — Adam Gase wore his cap with the bill tugged even lower than usual Monday, as if trying to avoid looking at the big picture. It’s not pretty. His Miami Dolphins (5-6) have lost six of their past eight games, including two in a row, to fall below .500 for the first time in 2018. And now they’ve earned a reputation for blowing double-digit fourth-quarter leads. They did it for the second time this season Sunday, when Indianapolis erased a 10-point deficit in the final 8½ minutes to win 27-24. In Week 5, Cincinnati rallied from a 17-point deficit and scored four times in the fourth period to beat Miami 27-17. “You’re disappointed because you’ve got two games where you’re going, 5-6 (could be) 7-4,” Gase said. Quarterback Ryan Tannehill played Sunday for the first time since the Cincinnati debacle, when he hurt his throwing shoulder. He went 2 for 4 for minus 3 yards in the fourth quarter against the Colts but still finished with a passer rating of 119.4 and emerged from the game in good shape physically. Miami’s meltdown was a whopper, however. Indy outgained the Dolphins 200 yards to minus 1 yard in the final 13½ minutes. “The way it went down, obviously, really hurts,” Tannehill said. The collapse triggered a frenzy on social media, with Gase’s play-calling criticized like never before in his three seasons as head coach. He acknowledged second-guessing himself regarding one call, saying the Colts’ scheme surprised him on a second-and-10 pass into the flat to DeVante Parker that went for no gain during a three-and-out before the Colts’ winning drive. As a result, the Dolphins had three takeaways, deflected a punt, scored on a 74-yard pass and still managed to lose. With the defeat, the Dolphins fell behind seven teams in the AFC standings. They’ll likely be favored in only two of their final five games, including Sunday at home against Buffalo, and appear destined to miss the playoffs for the 15th time in the past 17 years. It can be argued that the Dolphins are worse than their record, and below .500 is where they belong. They rank 28th in the NFL in offense and 29th in defense. They’ve been outgained by 928 yards, third-worst in the league. Injuries continue to ravage the offense, with receiver Danny Amendola (right knee) and center Travis Swanson (ankle) the latest casualties. The status of both for Sunday’s game is uncertain. But Gase predicted his team will bounce back from the latest loss.